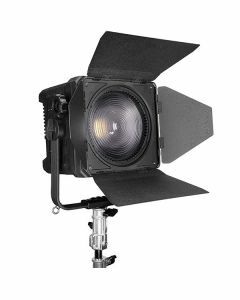 The Ledgo D3000M is a fresnel studio light with a colour temperature of 5600K. The D3000M has a stepless control taking it from a spot light to a floodlight as well as attachable barn-doors for further shaping of the light. In addition the D3000M also has a fanless design meaning no a noiseless operation and an intuative LCD display with a manual dimmer and you can control the light over wifi via the Ledgo mobile app.